Handmade in England, Nicki MacFarlane's award-winning occasion wear has been featured in countless leading bridal magazines with clients including HRH Duchess of Cambridge. 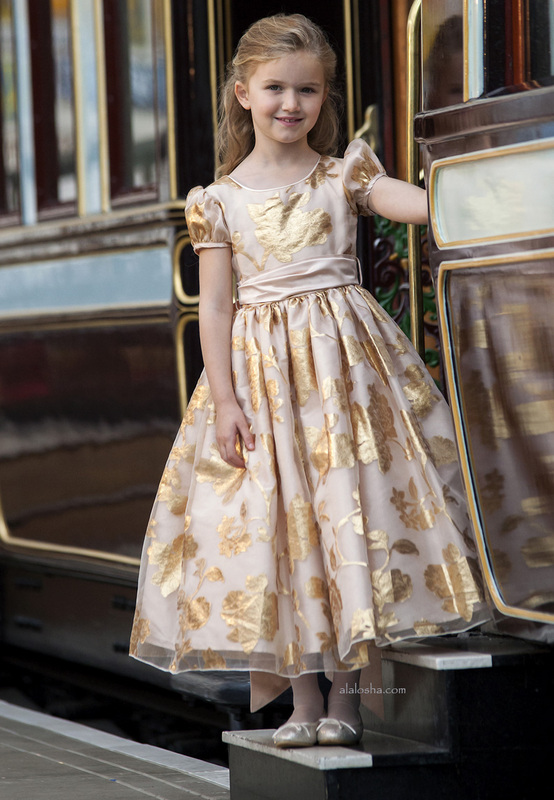 You can choose from a wide range of styles in a stunning colour palette specifically designed to flatter a varying age range – from the smallest flower girl to the more sophisticated older bridesmaid. 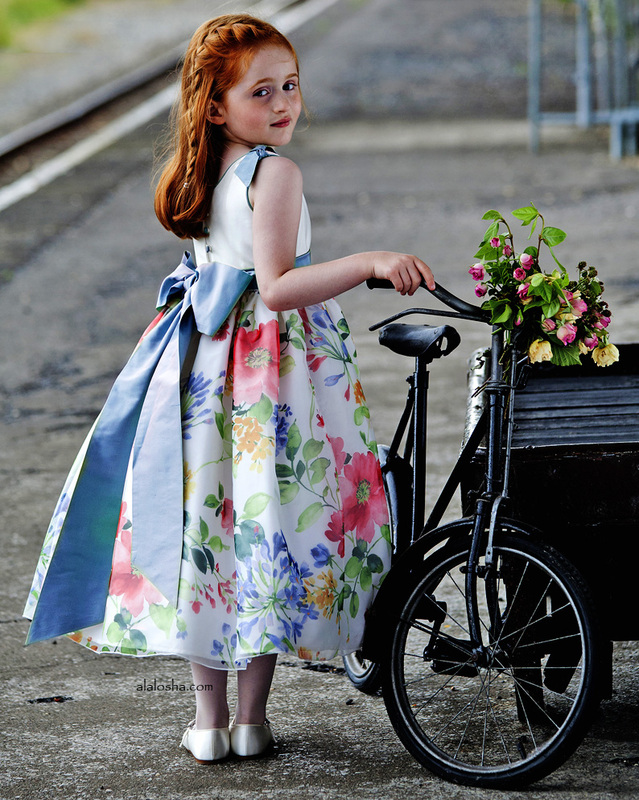 Girls gorgeous, ivory silk, special occasion dress by Nikki Macfarlane, featuring a fabulous, ballerina length, organza skirt with a beautiful blue, green, red and yellow floral print. Fully lined, it has an ivory underskirt, with layers of tulle for extra volume and a beautiful blue, shot silk sash around the waist. The bodice has matching, detachable, blue silk bows on the shoulders, a blue button fastener at the back and coordinating piping around the neck and arms. 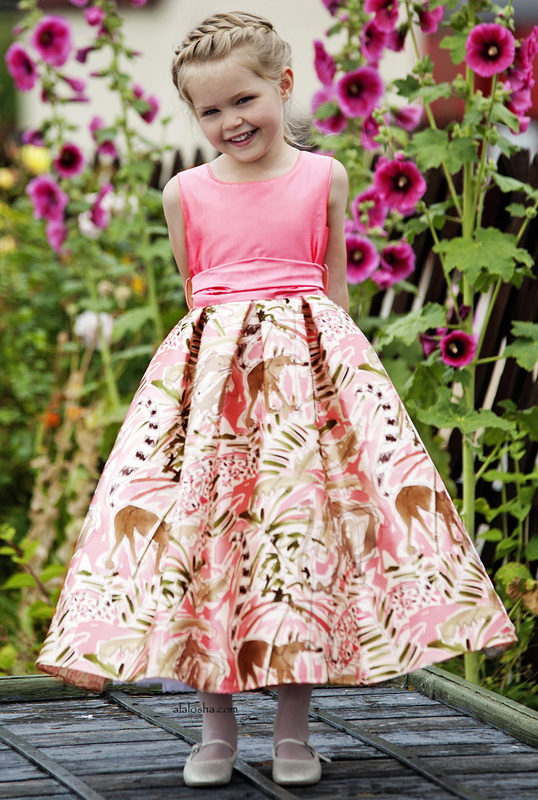 Girls lovely pink, special occasion dress by Nikki Macfarlane, with a shot silk bodice. 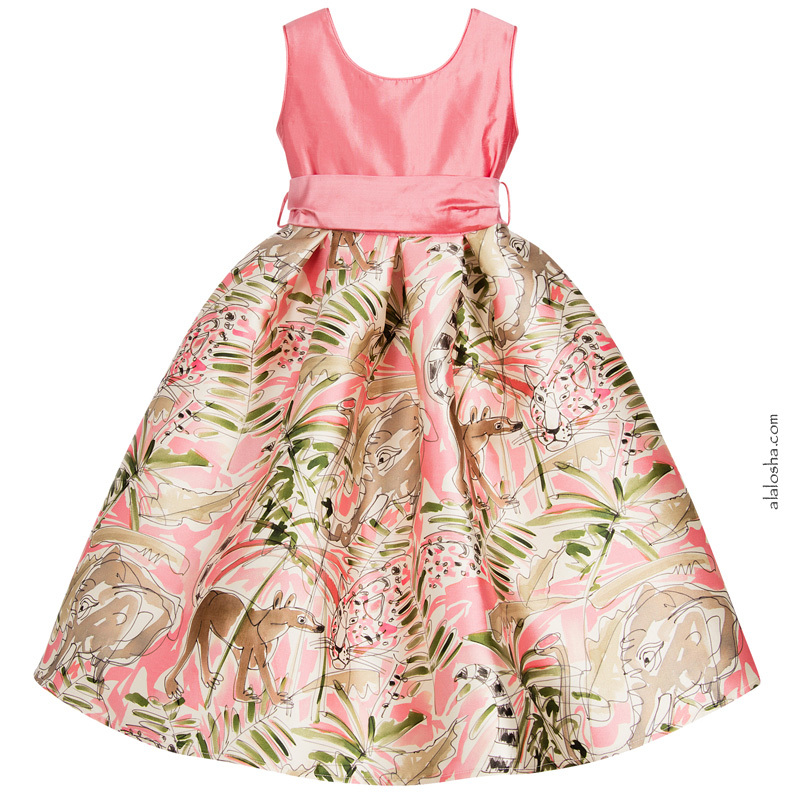 The skirt has a beautiful pink and green jungle print with leopards and lemurs. Fully lined, there are frills of tulle for extra volume and a gorgeous pink, shot silk sash around the waist. There is a pink, silk-covered button fastener at the back. 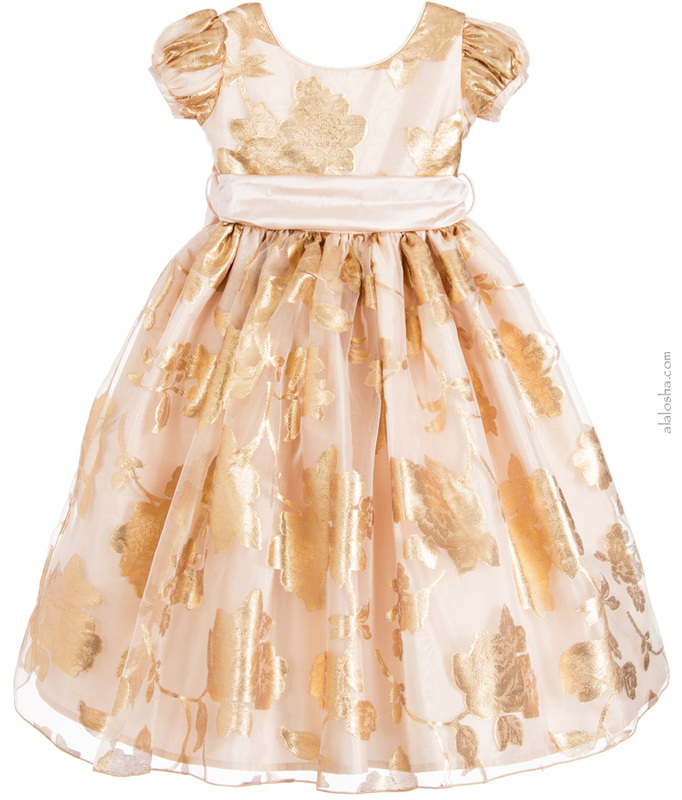 Beautiful rose gold dress by Nicki Macfarlane. The organza overlay has a gold floral jacquard weave, with a silky lining underneath, short puffed sleeves and a round neckline. The flared ballerina length skirt has layers of stiff tulle petticoats underneath to create a voluminous look, perfect for little princesses. There is a gorgeous pink silk waist sash that secures in a large bow at the back and silk covered buttons to fasten. The pure nature of silk means that there may be slight imperfections within the fabric. Nicki Macfarlane is the designer of the elegant dresses worn by the bridesmaids at the Royal Wedding of HRH The Duke and Duchess of Cambridge. 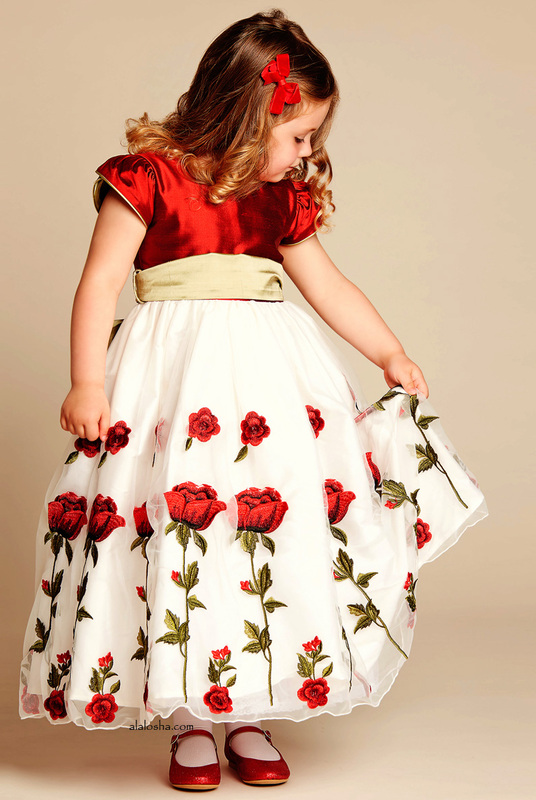 Girls beautiful ballerina length dress by Nicki Macfarlane. The burgundy red, fitted bodice is made from luxurious silk taffeta and has short puffed sleeves. It is trimmed with olive green to match the covered button fastenings and silk sash belt, which ties into a gorgeous bow at the back. 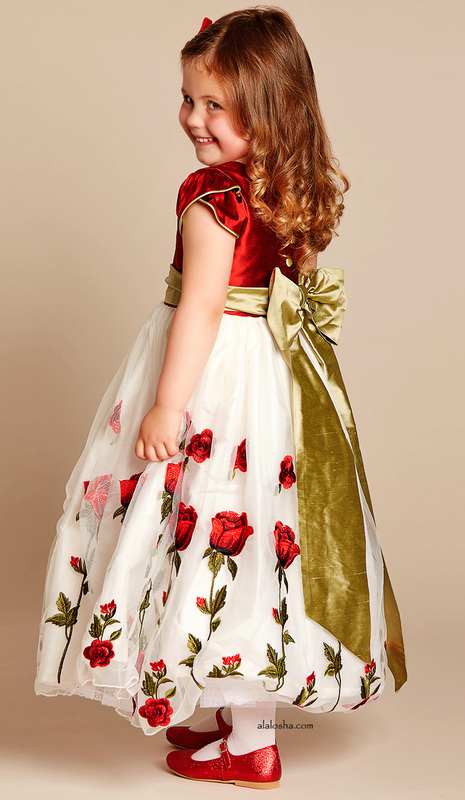 The stunning full and voluminous skirt is in soft tulle with red embroidered roses, over taffeta, has layers of tulle and is lined for comfort.